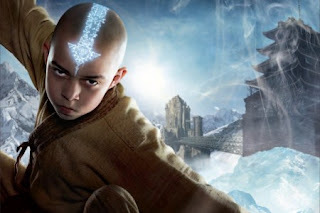 Amanda, a couple of friends, and I went to the midnight showing of M Night Shyamalan's Avatar: The Last Airbender tonight (or should I say this morning?) because, for those of you who don't already know this, we are die hard Shamalan fans. He's possibly the most creative and complex storyteller in the business today (though some have difficulty seeing seeing through the subtleties of his symbolism). Now, usually at a midnight showing, the theatre is packed with dedicated fans and, because of this, audiences tend to applaud at the finally... even for the latest Indiana Jones film there was a standing ovation in the theater I attended. But tonight, at the end of Avatar, there was an odd response. I was surprised and saddened to hear booing and words of disapproval from those around me. I was saddened because I had just finished watching a beautiful story come together. I don't know what others expected to get from this movie. Being completely unfamiliar with the cartoon which inspired it, I had few expectations. Perhaps folks expected a more mature film. It was quite obviously geared toward a younger crowd. Perhaps (but probably not) folks were expecting Shamalan's typical depth and symbolism. This was, after all, one of his more simple films in terms of symbolism and conceptual depth. But I found it to be nothing short of brilliant storytelling (the vast majority of writers/directors could learn a lesson or two from M Night). It was unique for Shamalan. First of all, as I said before, it was a kids movie. Secondly, it didn't implement the full spectrum of Shamalan's typical use of color (although it's use of imagery was superb). Thirdly, it was based off of a preconceived idea. Fourthly, it was highly dependent upon special effects. And finally, it wasn't based in Philadelphia. These all should have served as hints that all bets were off. This was not going to be your typical M Night film (if there is such a thing) nor is it going to be the action thriller that some may have anticipated. Perhaps the negative response I heard in the theater tonight should be blamed on the marketing. Overall, Airbender is a fantastic story, though it's not without a few shortcomings. It deals with such concepts as the use of power, the need for humility, the interdependence of humanity, and the hope for enemy love. It is perhaps one of the best family films of the year. I will defiantly see it again (this time in search of deeper symbolism, I'm sure there's plenty more to be found) and I look forward to the sequel.